Good to know all is well. Keep us updated on progress. No worries, Thanks for sorting that out for me. Techniplan printed them straight away, and the plans should get here today, so all is well with the world! Thanks for nudging me, your StairFile actually got lost in my list of to-does, sorry about that….. I attach the files for your stair. I need to start thinking about getting these plans off to the printers. 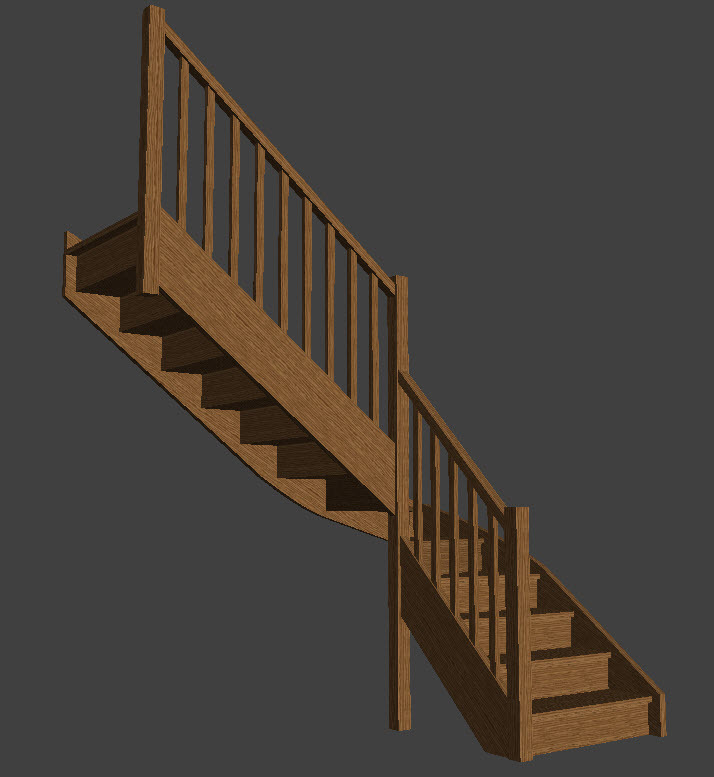 Thanks for looking the stairs for me, I’ve added the landing step as you suggested, and moved the newel to suit. I hadn’t realised that was how to do that, so thanks for spotting it! I didn’t mean to add any recesses, and have unselected ‘perpendicular penetration in stringboards’. Was that the culprit? I like the winders, and don’t mind the challenge of them. It is also what the client has chosen, so I’d better keep them. I messed about with moving the steps, to see if there was a compromise to be found in making the steps a little straighter, and am thinking of keeping it like this (i will straighten the strings and hand rail on the plan) What do you think? I did give up after a little while of ‘messing about’ with the ‘move step’ feature, so please free to tweak them if you can see a better configuration/easier build that keeps the winders. I have lengthened the newel to the ground as you suggested. Thanks for buying a StairFile service. Looking at your project, I’ve noticed one or two things that you might be able to tweak. – you haven’t set a landing step. this means that the stair is calculated to the last step nosing. You might find it useful to add a landing step so that the stair is calculated to behind the last step. In this way the last riser is assembled into the post and landing step, which make for a neater finish and a more robust fixing to the first floor. In general you would not put a landing step only if you are really tight for space and need the extra tread line, whereas in your case you have plenty of room. I attach a model with the landing step set to 100mm and the last post set flush behind it. This means that the post will rest against the first floor joist, which may or may not be what you want. You can however adjust the post position as you need it. – You have added recesses to the front and back of the step housings. The front is set back 150mm which seems a lot. Is there a specific reason for this? If not I personally would not use a recess, but if you do I would only set it back a coupe of centimeters at the most. What do you think? – Your stair is set up with all the steps tapered. You might find it easier to build them if winders are limited to the turning and the string boards and handrails are set to straight. I have done this in the attached model. – I have also set the intermediate newel to sit on the floor. – To make cutting the housing easier I’ve adjusted the step housings around the newel so that they sit better on the newel faces. As I don’t know the exact configuration of your project, these are of course just suggestions, so feel free to adjust as you feel necessary. Thought I had attached the updated file, did you not receive it? I didn’t change much, just the width of the strings and the height above the nosings was all, I think. I’ll try and add it again. I’ll put together a little sketch now, rather than trying to explain it in words. Sorry for the delay. I’ve just paid for the stairfile pro service now. It is indeed hard being self employed sometimes, but I do love it, so mustn’t grumble too much!! The insurance company have just asked for some documents, so hopefully things are starting to move forward on that score. I had three months without any income at all, and lost my van and a lot of (fairly expensive) tools and have had 0€ help so far with getting back on my feet (not easy i can tell you). Anyway I won’t bore you with all my woes. Don’t know if you need more info on the stair/well etc, actually thinking on, I have made some minor alterations myself, so i’ll re-send it. Hi Luke, sorry to hear about the accident, glad you’ve got understanding clients…it’s tough working for yourself when this kind of thing happens. That service would include a review/revision as well of course. Just been reading through the previous posts. Seems all that rushing around was for nothing after all!! It’s been sometime since I last posted, the day after my last post, (27th october 2015) On my way home from the workshop, I was hit by a car travelling at considerable speed (the impact was so violent that it tore the engine from my van). It seems that the driver of the other car suffered a stroke at the wheel. After months without being able to work at all, I have for the last couple of months been trying to get back up to speed with my jobs (I am fortunate enough to have very understanding/patient clients). I have attached another staircase design that I’d like to get printed up. Would you be mind having a quick look at it please? I didn’t pick up your reply, till 24 hrs after you sent it, so it was more me that was too late! Thank you so much for sorting that out for me. It was too late on saturday afternoon, to find a printshop that was open near here, but I have spoken to my clients, and they are fine with waiting a little longer for the stairs, so all is well with the world. Will get the prints today. Here are the pdf files for the second stair. Just output the strings and posts, the rest should be the same. I’ve been busy and didn’t see you were in a rush. I am right in the middle of machining the parts for the first stair, and have just noticed that the plans are for the second storey stair. The only major difference is the height. But this impacts slightly on most of the parts. Is there any chance I could have the info for: Cut strings, Newels and handrails for a height reduced from the 2720mm to 2640mm please? I am happy to pay for the printing of full size templates for the whole thing, but would need it to get here in the next two days. don’t know if this is possible. If not, I will mark out the parts by hand. Sorry if this is a pain but I’m on a very tight schedule, and clutching at straws a little. Good to hear you can work with the printer. I’ve used them several times for StairFile customers and have been very satisfied. For the cut strings, StairDesigner doesn’t draw the penetrations into the newel, you’ll have to mark them by hand onto the strings and the newels. The actual version doesn’t cope very well with cut strings but it’s quite easy to add this detail onto the pdf print outs. This can be where the plan view comes in hand. With a plan view you can measure the distances and mark them onto the post and strings. The plan view is very helpful to work out the detailing around the posts and generally in the corners where parts intersect. If you can’t measure from the dxf CADD drawing, I would suggest you print the plan if possible. Don’t hesitate to post your questions if you need advice on marking up or transferring the plan view dimensions onto the parts. Also, I was wondering if you systematically print all of the PDF files? Not sure I need a full scale plan for example. Thanks for the lead on the Printers, I’ve just spoken to them on the phone, and they seem happy to help, and post to me here (Rochechouart, 87600, Haute Vienne). So that’s great. Just one thing that I’d like to alter on the files, I noticed that I didn’t add any penetration of the cut strings into the newels, this means I will have to mark out the mortices by hand. Not the end of the world, but if it’s simple for you, would it be ok to change them before I print? Not to worry if it’s too late in the day for the changes.